Hungry for that big, barbeque flavour? Order your lip-smacking ribs, burgers and loads of sides from a Lone Star Rib House restaurant near you. Get Lone Star Rib House delivered to your door! 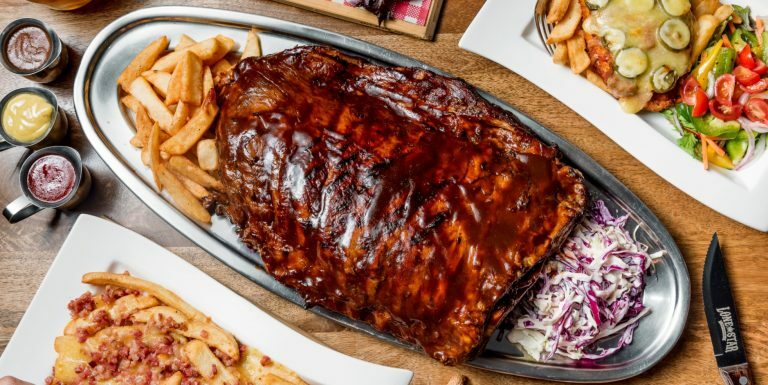 You don’t have to travel to Texas to get that old fashioned famous barbeque flavour, when Lone Star Rib House is right here in Australia. From Big Ribs drowning in Texas butter (also known as gravy) to Chili Dogs nearly as big as Texas, and burgers topped with bacon, the menu has something for everyone. And don’t forget to leave room for the most mouthwatering desserts which include the famous Brownie Blast, the Choc-A-Hoglic’s Triple Chocolate Mud Cake or the cheesecake of the month. If meat isn’t your first choice, Lone Star also has a wide range of chicken dishes, salads, sides, chips and lots of other trimmings. With over 23 locations across Australia, you can dig into a Texan meal whenever the hankering hits. Can’t shake the craving for a real authentic Texan feed, then Lone Star Rib House has you covered. Whether you need a meal for one or to feed a ravenous party, you can order quickly and efficiently through Menulog, and in no time, your burgers, ribs, schnitzels and all the sides you desire will be delivered straight to your door.